OUT OF STOCK - LEAD TIME: Late April. Call 0800 014 8700 to pre-order your new Agri-Fab aerator today! 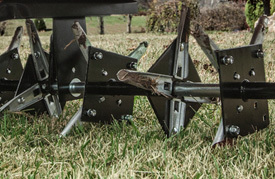 The Agri-Fab 45-0299 plug aerator will remove ¾" diameter soil plugs from the lawn allowing compacted soil to loosen up in addition to the benefits provided by a spike aerator. Best used in spring or late autumn for easily compacted soil like clay, heavy traffic areas, and drought damaged lawns. Up to 80kg/175lbs of weight can be added to the weight trays. Featuring a working width of 48", the Agri-Fab 45-0299 has 32 heat-treated pints, 4 per spool. 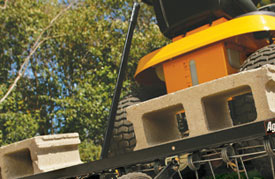 Of rugged construction, it has an aeration depth up to 3". The aerator knives are galvanized for rustproof durability. Transportation between working areas is aided by the metal spools being raised from the ground by a single lever, which is accessible from the tractor seat. A recent improvement comes in the shape of run flat tyres which eliminates the chance of a puncture. 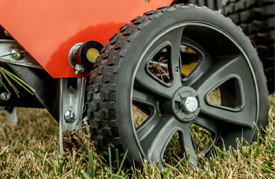 Supplied with a universal hitch pin, the Agri-Fab plug aerator is suitable for towing behind all makes of ride-on lawn mower. Working Width: 106cm / 42"
Aeration Depth: Up to 3"
Dimensions: 35" x 60" x 36"
Took several hours to construct . No parts missing . Using water as ballast helps .cores vary from 0.5 to 2.0 inches dependent on terrain .